Lundin Petroleum announced Monday that its wholly owned subsidiary Lundin Malaysia BV has discovered oil at the Bambazon exploration well, in Block SB307/SB308, offshore East Malaysia. The Bambazon well encountered approximately 50 feet of net logged reservoir pay with oil shows over three main reservoir intervals. The well, which was drilled using the West Prospero (400’ ILC) to a total depth of around 4,527 feet, has been plugged and abandoned and will be expensed in the first quarter of 2016. 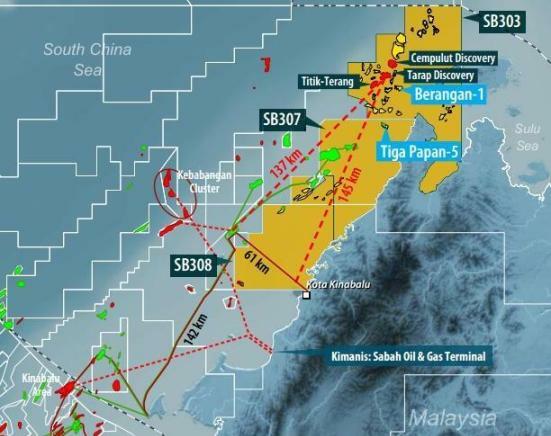 Lundin Malaysia holds an 85 percent working interest in SB 307/308. PETRONAS Carigali Sdn Bhd holds the remaining 15 percent working interest. Lundin Malaysia operates six blocks in Malaysia - PM307, PM319, PM308A, PM328, SB303 and SB307/308. Lundin Petroleum also revealed today that another of its wholly owned subsidiaries, Lundin Norway AS, commenced the drilling of exploration well 16/4-10 offshore Norway. Well 16/4-10 will explore the Fosen prospect, which is located on the southern flank of the Utsira High, west of the South Viking Graben in the North Sea. The main objective of the well is to test the hydrocarbon potential and reservoir properties at Jurassic sandstones level. The Fosen prospect is estimated to contain gross unrisked prospective resources of 192 million barrels of oil equivalent. The planned total depth for the well is approximately 8,200 feet. The well will be drilled with the Island Innovator (mid-water semisub). Lundin Norway is the operator of PL544, in which the well is located, with a 40 percent working interest. Lime Petroleum Norway AS and Bayerngas Norge each hold a 30 percent working interest.